Tests give developers a way to ensure reliability and dramatically improve the quality of third-party development. For the Dynamo project, tests are expected with pull requests to help the Dynamo development team know that a new feature or bug fix is robust. The Dynamo source repository contains thousands of unit tests and is an excellent reference for learning how to write one. The DynamoSamples repository also contains basic examples of tests that we will walk through in this section. To prove how a current behavior is broken for a bug we want to fix. To prove the reliability of a new feature, new node or even just new APIs. For example, if another contributor makes a change that causes a node we created to stop functioning properly, it should also cause any tests we created to fail. This helps to eliminate possible causes of an issue and identify its source. The Dynamo project uses two types of tests: unit and system. Unit tests test small "units" of code, such as methods, to find logic errors. System tests test the entire system similar to how a user would interact with Dynamo. This typically involves creating a Dynamo session, opening a Dynamo file, evaluating it, and ensuring that the results are what we expected. TestServices.dll contains the base class for Dynamo unit tests. SystemTestServices.dll contains the base class for Dynamo system tests. These libraries contain base classes that will handle operations such as initializing Dynamo and its geometry library for unit tests or providing access to the Dynamo workspace in system tests. Before we write a test, running one located in Dynamo&apos;s source files will illustrate the process and results. First we need to install the NUnit 2 Test Adapter so that Visual Studio discovers the tests. 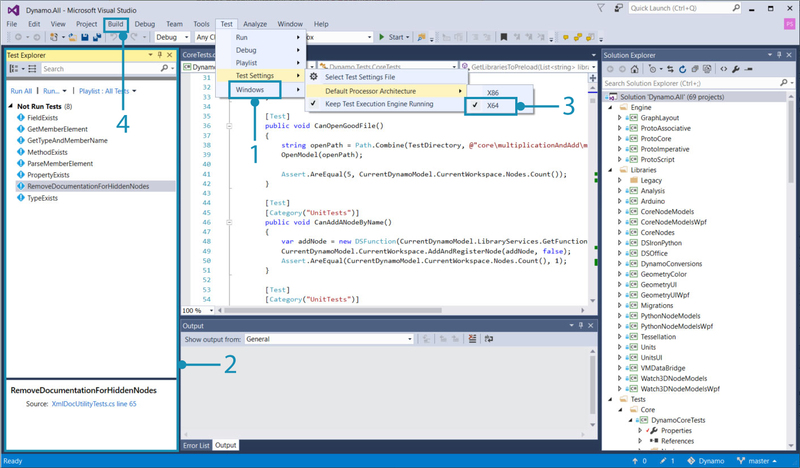 In Visual Studio open the Dynamo solution file Dynamo.All.sln and the Test Explorer. Set the test settings to x64 otherwise the tests will not run, then build the solution. Build the project by selecting Build > Build Solution. All available tests will appear in the TestExplorer Not Run Tests category. Select a test to run. The CanSaveImage() test from DynamoCoreWpfTests will test Dynamo for whether or not it can save an image. Running the test will open Dynamo, add a node, and capture an image all very quickly. Right-click on the test and select Run Selected Tests. If the test runs successfully it will be under the Passed Test category. The output of the test. Here we can see that the test created a new home workspace. Most tests we create for packages will be unit tests. They should be small, fast, and reliable. If we want to test a Zero-Touch node, the test should test only that DLL and make calls directly to that code. We will walk through how to set up a package with tests using the the DynamoSamples repository. Start by downloading the Github repository for DynamoSamples and opening the Visual Studio solution file. We also need to add the Tests package with the NuGet package manager. To run tests we need to point the test libraries to Dynamo&apos;s installation directory with a TestServices.dll.config file in the SampleTestsLibrary project folder. DynamoSamples already has this file, otherwise we would need to create one. Now build the solution to get the tests. If we open the Test Explorer window there should be three tests from the SampleLibraryTests project. Tests should be contained in a separate project. If we wanted to test a method in this project, we would need to reference that library in the test project. The tests we see in HelloDynamoZeroTouch.cs are very basic but include the key components. public void FailingTest() tests if Dynamo will throw an exception when the Line.ByStartPointEndPoint(p1,p2) method is given identical points, which is impossible to create a line from. If we replace the Assert statement in the FailingTest with Assert.NotNull(myObject);, we are testing if Line.ByStartPointEndPoint(p1,p2) can create a line from points in at identical locations. Replace the code and run the test to see what a failure looks like. The failed FailingTest. Normally this is testing if the node can fail by throwing an exception. Now we are set up to write tests for any package we create. For an extensive list of reference tests take a look at the Dynamo source.